Why not come and check out our Church on Sunday! At Highfields Church we believe your University years are crucially important to your faith. We don't want you just to survive through University but to thrive through University and we want to help you achieve this goal. Do look through our website to find out more about what we offer, and better still do come and visit us! Student small groups evening for all Highfields students, once a week, term time! Interested in finding out more about what Christians believe? Monday nights? If you're an international student then there's a whole range of stuff specifically for you as you try to deal with the added pressures, frustrations and difficulties of trying to get your head round everything that's Welsh and British! If you're wanting to meet other Christians at your uni and to share the gospel with those around, then why not check out your university's Christian Union? 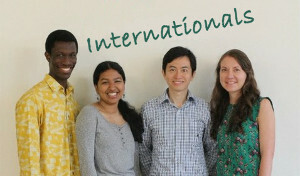 UCCF has a link up page where you can get in touch with your local CU. Are you wondering what to do when you graduate?! How about being a ministry apprentice at Highfields for a year? !